The Society of Campus Ministers | We are a society of Campus Ministers, lay and ordained, working with Episcopal campus ministries and ecumenical campus ministries that include Episcopalians. Whenever I fire up the computer, my oldest daughter is instantly at my shoulder. She asks me what I’m doing, who is that, where is that, and can I please check the weather. So when she saw me post this photograph on IG, Annie did not disappoint; she asked me how I made the sign. Did I buy it that way? Did I draw it? Was it the old sign? Had I replaced the old sign? I thought about her questions for a second. “It is the old sign,” I said, “the same one you’re familiar with. But it took 7 years, give or take, to make it look that way.” She stared at me like I was crazy, so I explained the story to her. 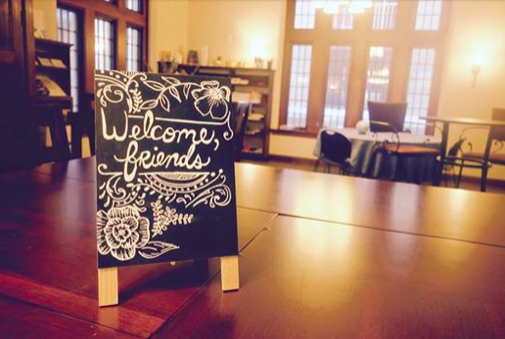 “Kelsey, one of our 3 awesome house fellows, asked me last week she could re-draw our chalkboard signage. Kelsey is a gifted artist. Kelsey became a house fellow this semester when the SFH team discerned the need for a third house fellow through honest and challenging conversations in community about hospitality, homelessness, and safety. Once the decision was made to add a new position, our two other house fellows invited people they knew to apply. Katie’s friend Kelsey interviewed and was invited to join the team. 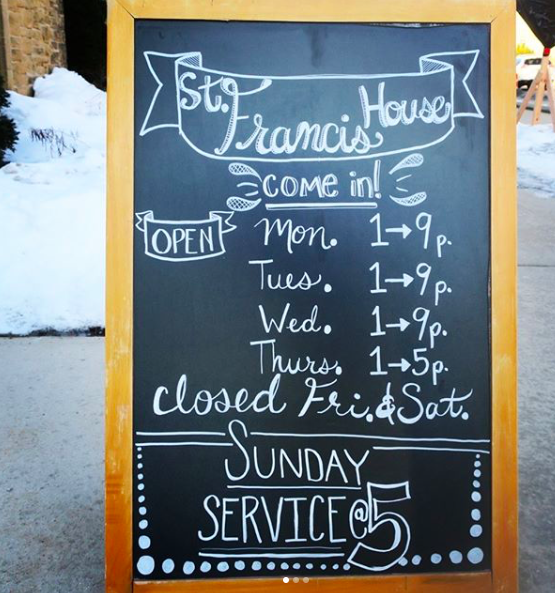 “For her part, Katie first strode into St. Francis House one Sunday evening a couple of years ago (do you remember? 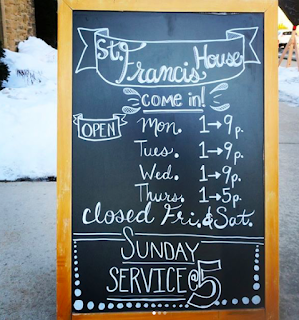 ), when she saw the same sign on the sidewalk, thoughtfully but less artfully decorated, with the single word ‘Taizé.’ She joined us for worship that night because she had gone on the Taizé Pilgrimage of Trust to Red Shirt Table in 2013. Katie longed to reconnect with some aspect of that time and the prayers that were shared there. Of course, you know that I was also at Red Shirt Table. It was the first trip the St. Francis House community made following my call to the position in 2012. It took 13.5 hours to drive there, and we camped for four days on an evacuated cow pasture. “Katie and I did not cross paths at Red Shirt Table, but it was through that trip that I met Steve, the campus minister at the University of Minnesota, who has become a dear friend to me. We talk at least once a semester to share joys, challenges, and ideas. He is a fabulous road trip companion. Anyway, Steve is a natural community organizer, and he had organized a bus of folks from Minnesota to make pilgrimage to South Dakota. Though they don’t know each other directly, Katie was on the bus. “So the sign said ‘Taizé’ that day, in part, because of that pilgrimage, and subsequent ones like it, and their shaping effect on the community, and that pilgrimage also happens to be the reason Katie found meaning in that word. I suppose, to be completely transparent, we would really need to go back to 2000 or so, when Mother Mary Kate invited me to make pilgrimage to Taizé and unwittingly prepared my heart to receive SFH’s history with the community as a gift and consolation. “But of course there were other factors, too. Katie and Kelsey, both Lutherans, met through the Lutheran program Young Adults in Global Mission, which accounts for the beginning, at least, of their friendship. And Kelsey’s journey as an artist is probably the most immediately relevant portion of the sign’s history, but those specific details are mostly unknown to me. “Kelsey recently received a full ride to a Lutheran Seminary. In this, she joins a growing list of recent SFH house fellows pursuing ordination across an ecumenical gamut: Methodists, Lutherans, and whatever they grow at Princeton. This modest mainline diversity delights me. God’s church is one, and we belong to each other because we belong to God; that’s at the heart of holy friendship.